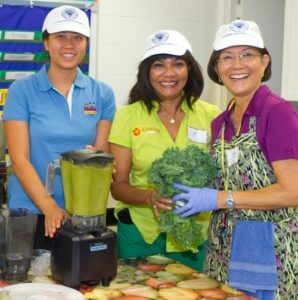 Dame Jan Yap shares this healthy recipe which she teaches to students for Liholiho Elementary School’s Food Day. Wash produce and precut veggies. To blender, add water and ice, lime or lemon juice if using, and fruit with highest water content first, then the rest. Fill blender to top with greens. Ensure there’s enough water for thorough blending by covering most of food in blender with water. Blend long enough to achieve smooth consistency, but not so long that the drink warms.